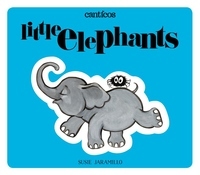 Little Elephants/Elefantitos is the 2nd book in the bilingual (English & Spanish) nursery rhyme collection from Canticos. This children's book is based on the song "Un elefante se balanceaba", a traditional Mexican counting song. It teaches little ones how to count to five plus serves as the perfect bedtime story. Each spread depicts a brightly colored numeral to help little ones learn to count to five. Book summary In this book, a number of elefantitos balance on a spiderweb, much to the annoyance of the spider. Counting with each additional elephant, children become familiar counting to five...until all the elephants fall down!